Native to the grasslands of Africa, many guinea fowl today are domesticated and farmed for meat and egg production. Farmers and gardeners also enjoy having guinea fowl around to eat insects and garden pests. Although there are several species of guinea fowl, they are all similar in appearance. The life expectancy of guinea fowls depends on several factors. According to Big Run Wolf Ranch, guinea fowl are expected to live between 10 and 15 years. Their life expectancy depends on factors such as success in breeding and raising keets, or young birds, as well as hunting and predation. Big Run Wolf Ranch states that it is essential for newly born keets to stay warm and dry to prevent death. Adult guinea fowls are hunted for their meat when in season and also fall prey to predators like carnivores and larger birds. New developments in agriculture also affect the guinea fowl's life span. 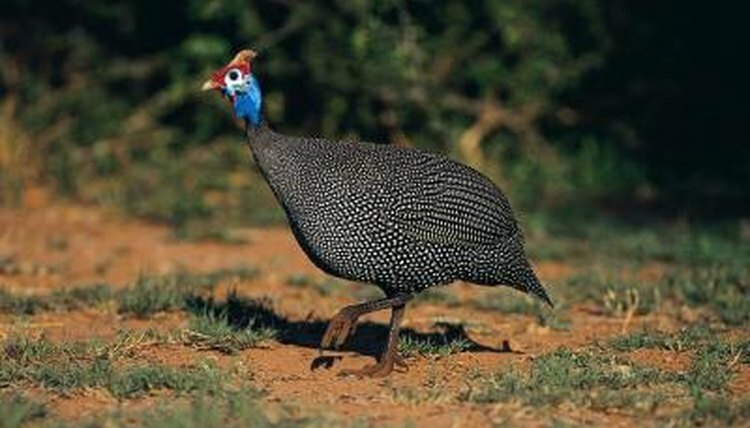 According to the Percy FitzPatrick Institute of African Ornithology, pesticides and diseases play a role in guinea fowl life expectancy as well as the loss of a suitable habitat and food resources. Increased poaching, especially in their native Africa, affects their life expectancy as well.